不可算名詞 [個々には 可算名詞] 【鉱物】 めのう (cf. onyx). 不可算名詞 《主に米国で用いられる》【印刷】 エゲート (《主に英国で用いられる》 ruby) 《5１/２ ポイント活字》. From Middle French agathe, from Latin achatēs, from Ancient Greek ἀχάτης (akhátēs, “agate”). (countable, uncountable, mineralogy) A semi-pellucid, uncrystallized variety of quartz, presenting various tints in the same specimen, with colors delicately arranged in stripes or bands, or blended in clouds. (uncountable, US printing, dated) The size of type between pearl and nonpareil, standardized as 5½-point. (countable, obsolete) A diminutive person; so called in allusion to the small figures cut in agate for rings and seals. (countable) A tool used by gold-wire drawers, bookbinders, etc. ;—so called from the agate fixed in it for burnishing. (countable) A marble made from agate. (obsolete) On the way; agoing. Agate ( /ˈæɡət/) is a microcrystalline variety of silica, chiefly chalcedony, characterised by its fineness of grain and brightness of color. 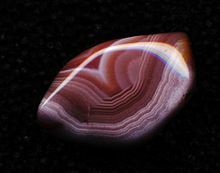 Although agates may be found in various kinds of rock, they are classically associated with volcanic rocks and can be common in certain metamorphic rocks.